Radha Beauty is a natural skincare line made with 100% pure and natural oils. I received the Intensive Youth Eye Gel, Vitamin C Serum, and Retinol Moisturizer for review. The Eye Gel is my favorite product. It's a light gel that glides under and around eyes leaving me with a cooling and refreshed feeling. It doesn't leave any residue the next day and appears to smooth out and brighten my eye area. I love how soothing it is. It is made with Plant Stem Cells, Matrixyl 3000, Hyaluronic Acid, Cucumber, Vitamin E, Aloe and more. It has a light scent of cucumber and aloe, and I love it. It's one of my go-to eye gels. The Vitamin C Serum is also a go-to product for me. It is a thin serum that contains 20% Vitamin C, Hyaluronic Acid, and an herbal blend. It works great under moisturizer and I apply it every night. It helps to brighten and improve appearance of the skin, and I find that it helps give my skin a nice glow rather than a dull texture. Lastly, I reviewed the Retinol Moisturizer which contains 2.5% Active Retinol, Vitamin E, and Green Tea. This moisturizer is creamy and feels good when it goes on. The Retinol does get a bit too strong for my skin since it is more sensitive and dry in the winter. So I can only use this once in awhile or else I get redness in my cheeks. But for less sensitive skin, I think this is a great product for anti-aging and wrinkle reduction. It contains moisturizing properties in addition to the Retinol so it's like a two-in-one product. 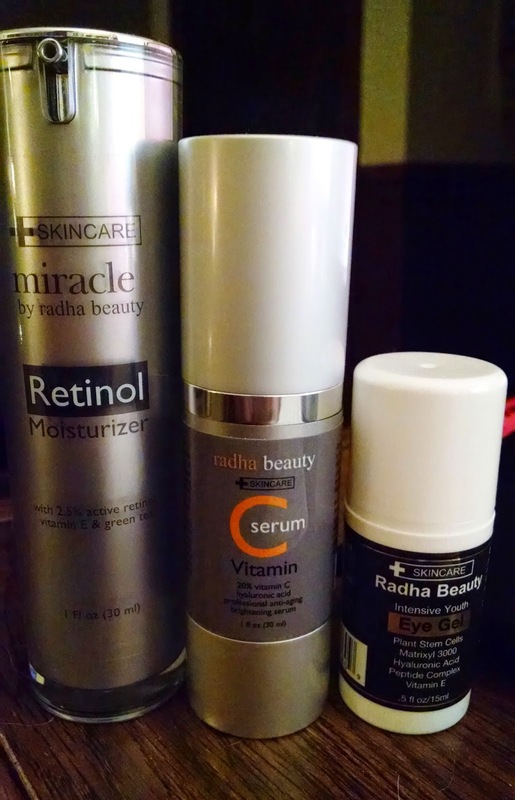 Overall, I am please with the Radha Beauty line and recommend the Eye Gel and Vitamin C for all skin types.